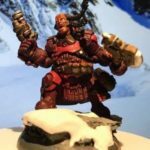 After painting Ossrum list, I created a survey on Mercenaries FB group. People helped me by voting, to choose next Caster to paint, build a list for him and play. MacBain won this competition, so let’s start building his list! Some mercenaries fight for a lost home, for revenge, for adventure. Drake MacBain fights for coin. No mission too dangerous, no battlefield too bloody, he’ll work for any of the warring nations of the Iron Kingdoms without moral qualm. MacBain fights with the gritty determination of the hired professional and will let nothing stop him from the completion of his contracts. He is the consummate mercenary and has the tools to finish any job. Countermeasure, while within 5″ of friendly faction model/unit affected by this spell, enemy models cannot make ranged attacks. I plan to cast it on Eliminators. High DEF, Stealth and Countermeasure.. this combination can be very annoying for opponent. Energizer, within MacBain’s ctrl range, whole battlegroup immediately advance 2″. This spell is amazing, I will try to cast it every turn. Remember, it also affect MacBain. 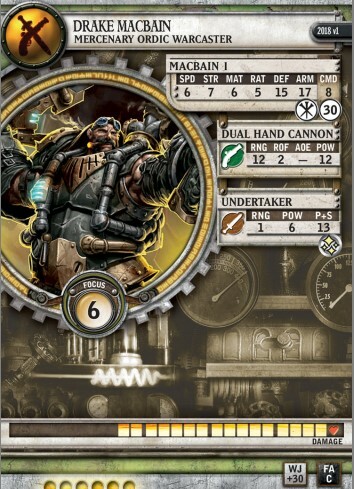 Fail-Safe, friendly faction Warjack gains +2 ARM and doesn’t suffer the effects of crippled systems. WOW! I love this spell. It will be great to cast it on Toro, making him 22 ARM “forever”. He does not supper the effect of crippled system, so it will be impossible to destroy his “Shield Arm”. 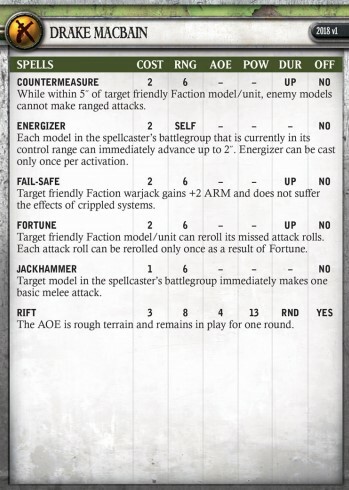 Fortune, friendly faction model/units can reroll missed attack rolls, each attack roll can be rerolled only once. Looks like very powerful spell. Casting it on Aiyana/Gorman/Eiryss will improve their chances of hitting a key target. Jackhammer, target model in MacBain’s battlegroup immediately makes one basic melee attack. This spell should work well with Galleon. Having Fortune on Galleon, we can reroll Jackhammer’s attacks – it can be great. Rift, AoE 4, pow 13 spell, AoE is rough terrain and remains in play for one round. For me, this is a very situational spell. MacBain probably will not have enough focus to cast it. Of course, if you really need to create a difficult terrain to prevent an opponent’s charge, this spell will be worth its weight in gold. Dodge – great he have it. Drake has 15 DEF, which in many cases makes him difficult to hit. Also, one oponent’s miss, can ruin his whole assasination plan. Gang Fighter – it makes our MacBain MAT 8 and pow 15 warrior. Not bad. Tough – nice addition, if we will find something, that provides him “no kd”. Without it, this Tough will save MacBain in very few cases. Also, his sword has Grievous Wounds, which can help in many parings. 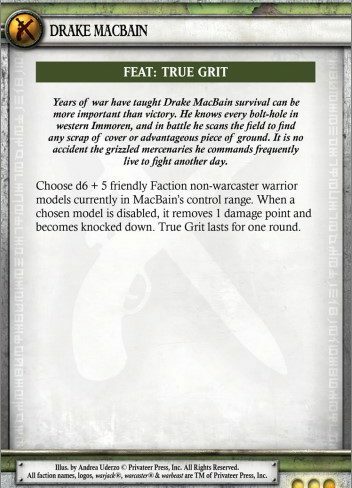 “Choose d6 + 5 friendly faction, non-warcaster warrior models in MacBain’s ctrl range. Looks like a solid “scenario FEAT”. 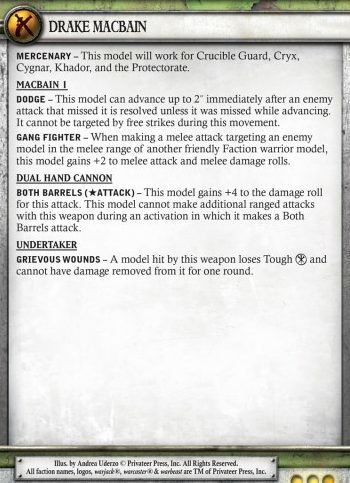 Models under MacBain’s FEAT will be perfect for contesting all scenario elements. They can also block charge lanes/line of sight and much more. Unfortunately, if the opponent has access to Grievous Wounds, our FEAT will not work. However, lists without Grievous Wounds, may have a big problem with this FEAT. I am very curious how it will work in practice! Drake MacBain looks very interesting. 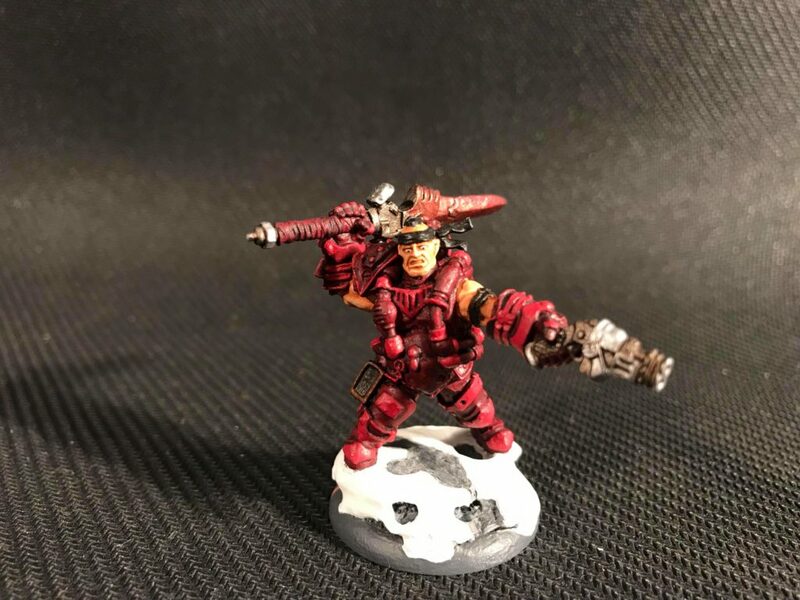 He mainly supports Warjacks, but his FEAT is great to protect important infantry models. For my MacBain, I chose Irregulars theme force. I know, this theme will get a nerf soon, but it is still my favourite for Drake. As soon as I paint more models, I’ll post their photos + info why I chose them to my list. So you weren’t tempted with unkillable Flamebringers and a Choir for your colossal in Llaelese Resistance 😉 ? I was thinking about it and it is great for sure! Try him in Kingmaker to get feign death and unkillible jam (unless GWounds). I saw you played it on Smogcon some time ago. It is really great, but I want expensive BG and Eliminators (for Countermeasure/FEAT). Irregulars theme looks the best for it. About FEAT, I will try some Pirates with Bosun – hope it will work well.